Yesterday (Jan. 6, 2011) was the sentencing for Gail Dobson, the day care provider charged and found guilty of murdering precious, 9 month old Trevor Ulrich. I went to the sentencing. I will forever support Kelly, Dominic and their entire family. The state's attorney said that the sentencing was to be called "Code Justice for Trevor" and let that ring out through the courtroom, just as the Code Light Blue, that forever changed so many people's lives, rang throughout the hospital on that dreadful afternoon of September 2, 2009. The state asked for the maximum sentence: 55 years. The defence asked for a sentence of involuntary manslaughter (though she had been found guilty of 2nd degree murder! ): 6 years under house arrest. 2nd degree murder: 30 yrs - 10 suspended 1st degree child abuse resulting in death: 30 yrs - 10 suspended. 2nd assault merged with child abuse. Sentences to be served concurrently So 20 yrs total. Justice has been served. May hearts start to heal. But may we NEVER forget Trevor James Ulrich (11/29/08 - 9/3/2009). Your posts about Trevor always make me cry. How anyone could hurt such a precious little innocent baby is beyond me and just truly breaks my heart. 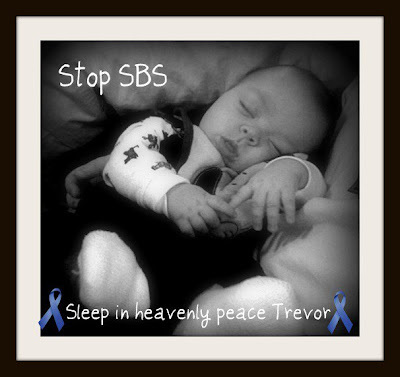 I hope Trevor's parents are able to find some peace and begin some healing now. I am grateful that they have such a good, supportive friend in you. Bless little Trevor.